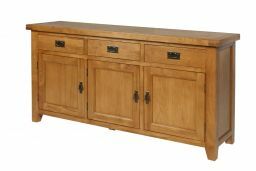 Country Oak 160cm large oak sideboard. Fully assembled ready to use. 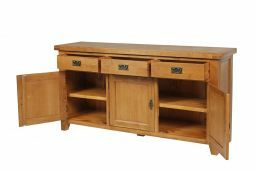 A very popular design of oak sideboard to match up great with any of our Country Oak dining furniture. 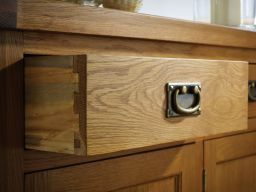 All drawers have dovetail joints. 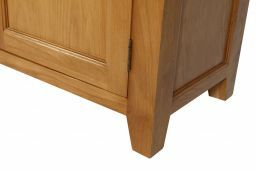 100% solid real wood drawers and backs. No ply. 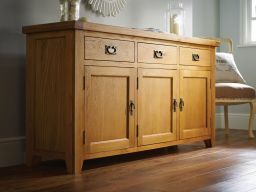 Dimensions: W1600mm x D440mm x H830mm Stunning new photo showing the large oak sideboard in high resolution. 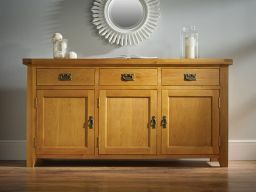 I am very pleased with this beautiful sideboard, (I also bought the mirror to match). 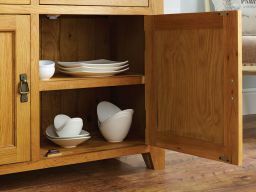 It’s very well made & has ample storage in the cupboards which I use to store my dinner service & china. 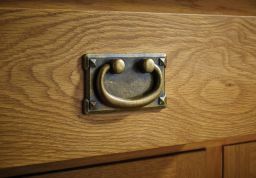 The drawers are very useful, two of which I store my cutlery in. I bought cutlery trays to fit but a nice idea would be the option to purchase these to fit. Love it! Very solid good quality wood. Delivered as promised and on time. Highly recommended seller. 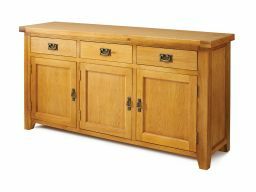 A lovely solid oak sideboard , excellent build and quality at a very good price.The delivery and service was very good too. Thank you Top furniture. Delivery on time and very courteous staff. Thank you, just a perfect match for our existing table and chairs. Solid but elegant. I am very pleased with my oak sideboards, they fit in beautifully with my revamped lounge. So far so good. Arrived very early last Friday morning and was in excellent condition when unpacked the next day. 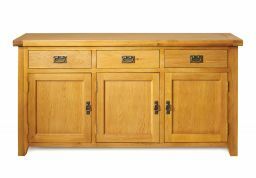 Solid piece, nice warm colour, plenty of room for dishes, crockery and three useful drawers. Looks lovely. 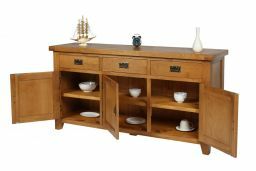 Beautiful sideboard with loads of space and gliding drawers. Very happy with my purchase. Great sideboard. 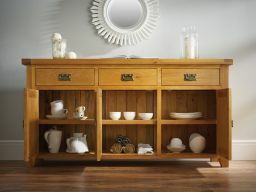 Looks amazing with other furnitures from the country oak line. 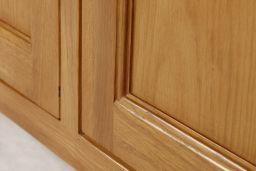 Beatiful finish, arrived with the door magnet broken I contacted top furnitures and recieved response immediately. Prompt delivery and friendly customer service. 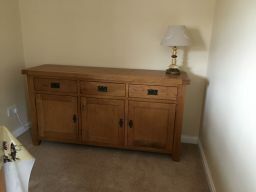 Really lovely piece of furniture, excellent value, really well made. Delivery punctual and driver very helpful and friendly. Would recommend. 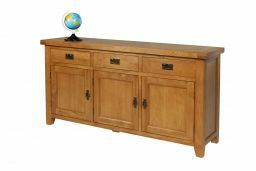 Very happy with the sideboard and the process of purchasing online and arranging delivery. Everything happening on time, on the day, as arranged. 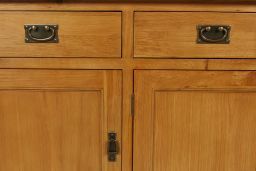 If I was being really "picky" there are a couple of things which are slightly annoying but understandable in mass produced "handmade" "rustic" furniture. 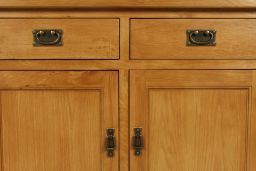 I think individually made furniture would have the wood grain matched a bit more so that it didn't look as if it had been constructed from many different pieces of wood. Also a little more attention to detail when aligning the door catches when they are right next to each other. 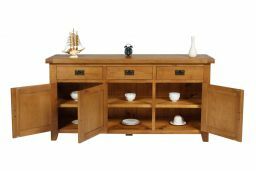 Very pleased with this purchase, and miles better than other high street oak furniture products, would definitely purchase from Top Furniture again. Delivery service was excellent and exactly on time, Thank you. Absolutely thrilled with our sideboard. 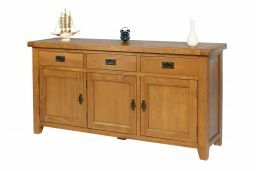 Communication re delivery was good and the sideboard arrived when expected and as expected. Looks heavy and high quality, makes a statement. Internal shelves are a different colour, a bit piney, but who cares about that really. Very pleased overall and delivered on time as advised. 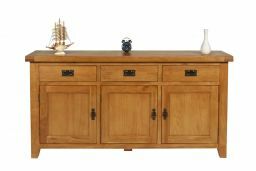 Fantastic beautiful sideboard. We love it! Extremely pleased with delivery, care of packaging and the quality of the unit. Great experience !!! Very well built !!! Ordering on site extremely easy. 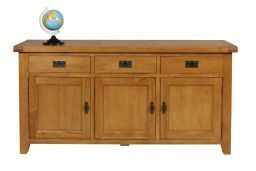 Photographic portrayal of ordered sideboard excellent. Delivered within a week! Delivery guys extremely pleasant and careful. Can thoroughly recommend this seller. Delighted with sideboard which is extremely well made. Very pleased with the sideboard. 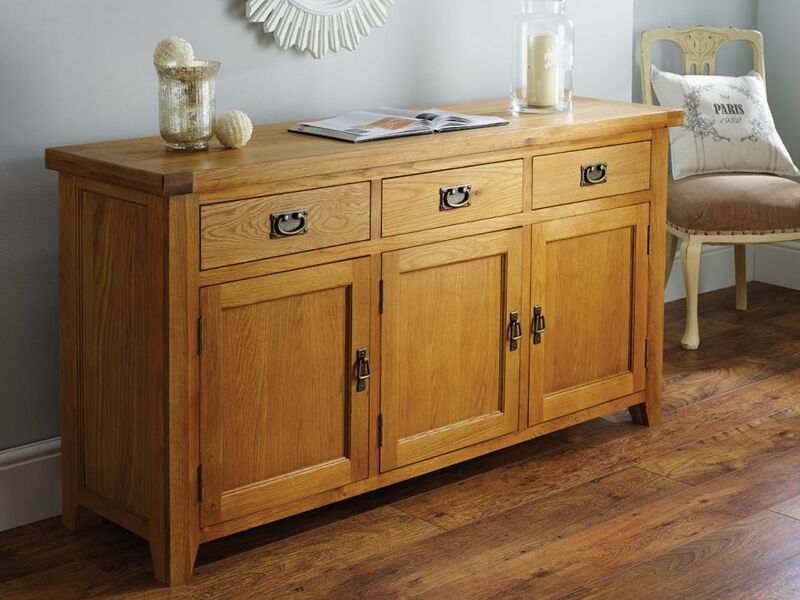 Matches similar country oak furniture in our living room. Solid build and best value I could find on line. Will use Top Furniture again. Very pleased with this beautifully made piece of furniture. 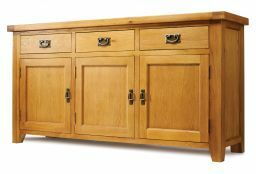 After looking around at many oak furniture suppliers we found this to be of excellent quality and value for money. 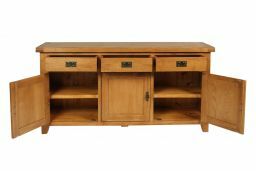 We also purchased a TV unit and two small side tables to match.Very friendly and helpful staff too. 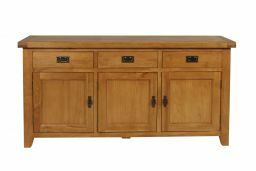 I purchased the large farmhouse sideboard together with a nest of tables and a t.v corner unit and am delighted with the them. I used this company 2 or 3 years ago and the quality is as good as when I originally purchased. You would find it very difficult to get such good value for money. Delivered at 7am in rain storm! well packed, good condition, very pleased. Very good piece of furniture, glad I bought it. Fits great in the gap we had for it and looks solid and strong, definitely buy from you guys again. Quick efficient service throughout and an excellent piece of furniture.